Sencha translates as steamed and is a very traditional technique of keeping the flavour packed in the tea. Unlike roasting which brings other characteristics this is a light and fresh cup. Our Green Tea Sencha is a staple green tea for everyday use, an all day tea that can be brewed up to 4 times. This is a smooth gentle fragrant tea if brewed for 3 minutes. A deeper flavour if brewed for longer.Traditionally a Japanese way to processing tea the Chinese took the method and made it their own. Bursting with antioxidants (the stay healthy and young ones) this is a must for every kitchen cupboard. Green tea sencha works wonderfully with seafood, salads, or chicken. 100% Organic chinese green tea. Infuse one tea measure per pot, use freshly drawn boiled water, allow to cool to 70-80 degrees before brewing, brew for 2-5 minutes. 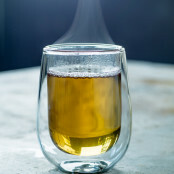 If using the pyramid tea bag, simply place one pyramid bag into cup, add a little cool water & top with freshly boiled water (this means the delicate green tea leaves won't be burnt which can cause the green tea to become bitter), then allow the green tea pyramid to brew for 2-5 minutes depending on your strength preference. Service rating : Dispatched and delivere promptly. It is the first time i have ordered the Green tea. I am enjoying it's delicate taste. The Breakfast tea i already use. I am trying to find a suplier where i can purchase the tea direct as the postage increases the cost considerably. Product : Good... Service rating : Dispatched and delivere promptly. It is the first time i have ordered the Green tea. I am enjoying it's delicate taste. The Breakfast tea i already use. I am trying to find a suplier where i can purchase the tea direct as the postage increases the cost considerably. Fantastic quick service, delivery man was very pleasant. A pleasure to do business with you. Love my Suki green tea. Thank you. Service rating : The choice of tea was superb and the service was outstanding. Will use the company again without a doubt. Brilliant! Product : Best Sencha we have ever tried.